The organ was probably made in the 1850s, perhaps by craftsmen associated with Sweetland of Bath. On the underside of the keyboard rail (behind the keys) is the pencilled inscription ‘C. Ayton London 1855’. On the bass backfall is written ‘For SWEETLAND 1854 rebuilt by W. Freeman’ and on the other side ‘C.Fleetwood 1854’ (this was noted by Derry Thomson in 1973, not by us). The organ came from Lyme Regis Wesleyan Church in about 1973, when it was restored by Derry Thomson (Musical Opinion, April 1975. Vol 98 (1170), 363-367). The organ evidently reached this Methodist church from another Methodist church in Lyme Regis. Derry Thomson may have removed the pedals and pedal pipes. The chipboard swell box was added in 1958 (A.L. Flay, Dorset Organ Specifications, 1974), which meant raising the pipe front. At some time the ivories were replaced with plastic, and the sharp keys were rounded over, in imitation of cinema organ keys, which work may date from 1972, or 1958, but may be older. 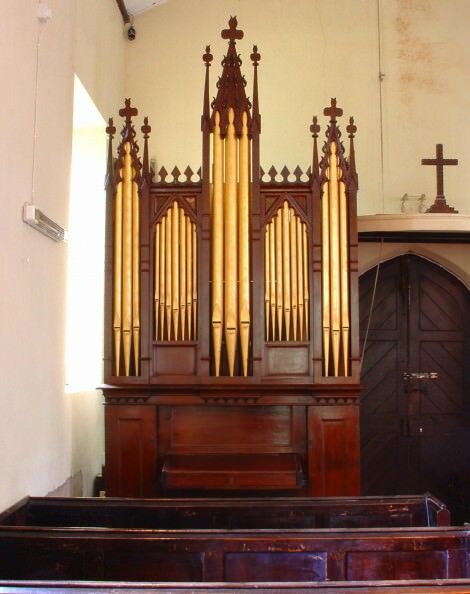 In 2005-6 the organ was restored with the help of a grant from the Council for the Care of Churches, and the money raised and the project initiated and guided to fruition by Brian Waldie of St Gabriel’s. The case was restored to its original height, and the finish restored by Charles Marsden. The restoration work was carried out by Stuart Dobbs and Timothy McEwen. A concert was performed by the Organ Advisor for Salisbury Diocese, Richard Godfrey, on October 7th 2006. The composition pedals reduces to Stop Diapason bass and treble, Dulciana, and Flute (left pedal) and produces full organ (right pedal), if these four stops are already out. The key compass is C – f³ 54 notes. The organ had a pedal keyboard, with a compass of 20 notes (C – g°), removed in 1972. It had a Bourdon, presumably clamped to the back of the organ. There was also a pedal coupler.